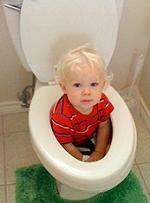 If you’ve ever tried potty training a child, you no doubt discovered it’s much different than house training a pet. Simply hitting your kid with a rolled up newspaper and rubbing their face in a used diaper doesn’t work, but you shouldn’t abandon all of those tried-and-true housebreaking methods just yet. Some people try using treats as reinforcement. Every time your kid uses the toilet, you give them a piece of candy or let them play fetch for a bit. This is a fairly humane method, but since kids get treats all the time anyway, there isn’t a huge incentive to use the toilet 100% of the time. I personally prefer the obedience shock collar. Make your child wear it all times, and if they have an accident, shock them before taking them to the potty. They will associate that sting of electricity with going in their pants, and unless your kid is a total retard, she or he should be fully trained in a few days. If your wife refuses to see reason and let you use a shock collar, try a different approach. If your neighbor’s dog continually shits in your yard like mine does, be sure to use this opportunity to repay the favor. All kids love to use the bathroom outside, so install a doggy door and tell them whenever they need to go, they can do it outside. Just make sure they know where the property line is and be sure they always go on the other side of it.